I’ve been down most of the week with a stupid cold, which is the stupidest way to be sick, as it’s “just a cold” and despite annoying and debilitating symptoms, is never anything but an unromantic, run-of-the-mill illness, engendering little sympathy and even a degree of dismissiveness. If I’m going to have some sort of health setback, I would prefer it to be a big, sweeping, dangerous illness with some panache, like consumption or Lyme disease. But nope. I am now almost a week behind at work due to a dumb, ordinary cold. I suppose I should have some gratitude, considering that it’s been about two years since I’ve been good and sick, and I have more sick days banked that I can use in a lifetime. All the same, it makes me very crabby. And today I woke up with what feels like a revival of symptoms, further engendering my crankiness about the whole thing. On a cheerier note, I was talking to a close friend of mine earlier this week, and together, we plotted our next lifetime. I have fits of belief where karma and reincarnation and all of that good stuff make total sense to me, and I have decided that I would like to have one life in which I get a mulligan. In golf, this is a shot not counted against the score, so translated, this would be a life not counted against my karmic growth. I would like one lifetime in which I am not here to learn a hard lesson or develop spiritually, but rather to simply have a fun, enjoyable and relatively care-free existence, with minimal grief and a dearth of troubles. I would be more than willing to make up for it later; I’m just asking for one little break on the wheel-of-suffering continuum. My friend and I decided we would be reborn in an idyllic village that only cool people were allowed to stay in, and we would live to exactly 85 years of age, at which time we would slip peacefully away in our respective sleeps. I don’t see why that’s too much to ask for. 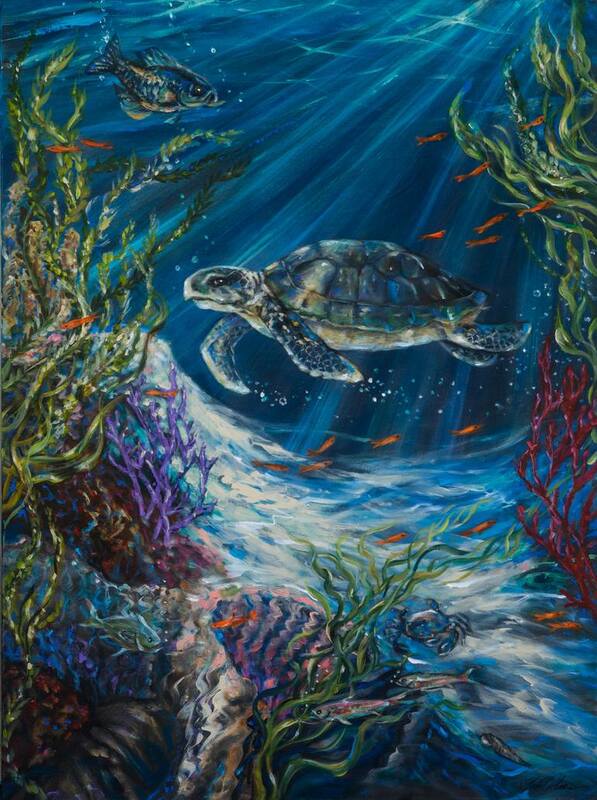 I am fond of turtles and water and things having to do with the sea, and I was lucky recently to find a whole collection of really cool sea-related art at Anonymous Big Box Craft Store. I needed some new art for my computer room wall, which has been haunted for the last five years or so with the specter of James Dean, Humphrey Bogart, and other Hollywood stars of yore, which I purchased and hung up in a fit of misguided nostalgia. I’ve been vaguely annoyed by these black-and-white Hollywood stars for some time, but I didn’t have anything to replace them with until now: My wall of the sea! I have a beautiful turtle, an octopus, part of a whale, and a generic sea-scape, and I’m quite pleased with my new, blue, purple and green-themed art wall. It’s all very watery and oceanianic and peaceful, which makes in turn makes me feel watery and oceanianic and peaceful, a good state of mind if you ask me.